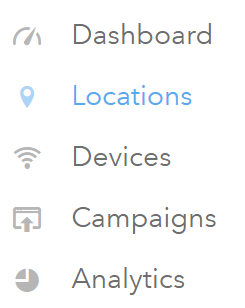 The Locations section puts together the devices you added in the Devices section and the campaigns you designed and created in the Campaign section. It also provides you with a quick overview of the location of the deployed hardware. It is also in this section where you control browsing settings. Use the steps below when adding a location on your dashboard. Click the Locations tab on the left side menu. Click the Add New Location button. Choose a method to add your location data. For Facebook, populate the page name or unique URL ending. For numbered URL endings, use the numbers only. For Google+, type the business or company name to search. If both Facebook Page or Google+ are not available, you can choose to fill the business information Manually to create the location. After you click the Create Location button, you will be asked if you want to assign an existing device or add a new device, you may also skip to assigning a campaign. If you choose to assign an existing device, select your device from the list then click Assign Device. If you choose Add New Device, the interface, the add a new device screen will be displayed. The steps are exactly the same as using Add New Device in the Devices section. After you assign a device to the location, you will be asked to create a new campaign. The steps in creating a campaign are the same as in the Add Campaign in the Campaigns section. Pro Tip: If a Facebook page is available, click the Create from button and enter the page name or number of the FB page URL, just like in step 3a. Your campaign design will be populated immediately. Click the Save button to complete the Add Location procedure. 🎉🎉🎉 You are now ready to deploy your social Wi-Fi network!